Yesterday I headed to Mt. Pleasant Quilting Company with a friend - they were having a special event, it was a gorgeous day, and we both had the time to "escape." 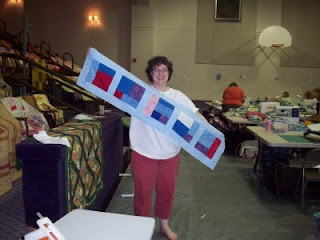 "I will be going to Spring Quilt Market in Pittsburgh. That’s where retailers go to see, buy/order the latest in fabrics, books, patterns, notions, gizmo’s and gadgets. Well - we are going to have a Quilt Market here in York, New York. (1st time ever in Western New York!) The big tent will be in the front lawn displaying fabric from 27 different companies. You will get to see the fabrics as I see them at Quilt Market and will be able to vote and tell me what your favorite fabrics are. You will be helping me make my decisions. You also will be able to see/buy/order the latest books, patterns, notions, gizmo’s and gadgets! 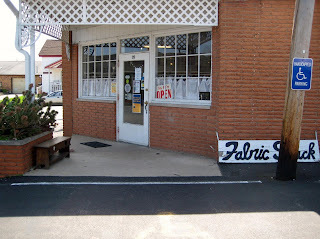 I will be able to bring a lot of “stuff” back with me from Spring Quilt Market in Pittsburg as I will be driving! There will be demos, and plenty of door prizes! 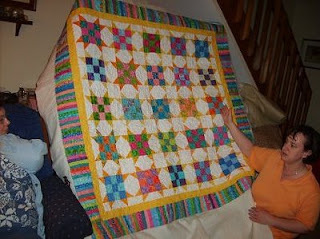 You will get to meet Jim Valderkolk who will be bringing this mini Quilt Market to us! There will be SURPRISE SPECIALS also! Whew! Sounds like an exciting day to me!" It was exciting - right up to Shellie winning a door prize as we stood in the checkout line to leave - although it was a bit frustrating to see fabrics you like in the tent - and know that they are not available yet. At least 50% of my quilt shop buying is that "I gotta have it NOW" impulse - and unfortunately I could not indulge in that. "The rest of the bolt" was over 17 yards - but the price was right and it is the perfect fabric for backing on at least two quilts that I am working on. 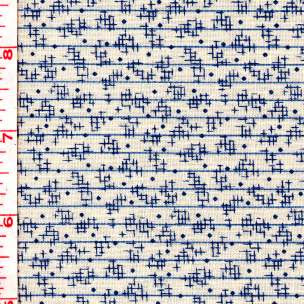 It also reminds me of my time in Japan - as it is very much like some of the fabrics I saw there - and will probably find its way into a king size quilt for our bed - perhaps as the backing, perhaps as one of the main fabrics. And I am also considering making a pair of summer jammy pants. 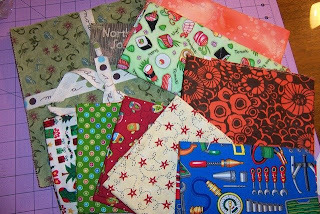 I need to get a photo of the rest of what I got - just 2 FQ's and 2 1/4 yard cuts. I did see the sample swatches for In the Beginning Lily Pond which the shop has ordered but had not come in yet. 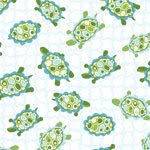 I am looking at this for a baby quilt for my neighbor - who also likes turtles. The baby is due in July and we won't know the gender until the birth, so I have a bit of time to figure out my pattern and yardages. Of course it won't hurt to have some extra, now will it??? 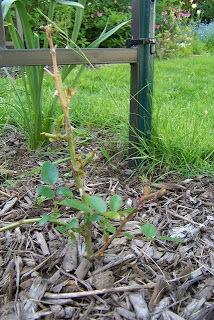 ...this was a cutting off the monster rosebush, one that I stuck in the ground and rooted about 2 years ago. The problem was that it was in a very narrow bed right off the driveway, and was not in a place for this to grow and thrive without impinging on our safety. So I moved it - or tried to. When I dug it out I only got about one strand of root in the process. I thought I killed it. But it knew better - and seems to be thriving in it's new home -getting ready to guard passage into the back yard. Most notable in my planting this year, however, is the heirloom tomatoes and peppers that my neighbor grew from seed - she had more than she could fit in her beds so I "adopted" whatever I could fit. 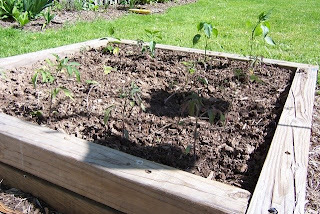 I think I counted about 26 tomatoes -not counting the ones in the hanging bags - and 12 or so peppers, plus 4 zucchini. I know - sounds like we are in a rut with those - but you add in the beans and peas, cucumbers, onions and hops, and we have quite a variety!!! And note Hubby's "cukamid" - a pyramid out of PVC for me to let my cucumbers climb on. I had them climbing and trailing last year, and the climbing fruit was much larger and more robust, and had fewer rot issues, so I am trying to get it all to climb this year. Sometimes the best ideas come when you are exhausted - or brainstorming with a friend. On my way home from the retreat last month, I had the wonderful opportunity to stop in Columbus, OH and visit with Joan Hawley. In addition to our mutual love of things Lazy, Joan and I are both avid gardeners working in small spaces. 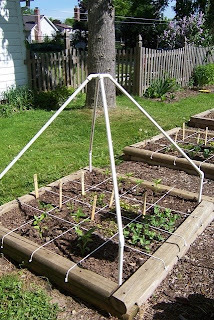 In the course of our rambling roving conversations that evening, we talked about those upside down tomato planters that are all the rage in infomercials and on QVC - and quite pricey in my opinion. Many many years ago I had used coffee cans for this purpose - under Mom's direction when I was a kid, and later shortly after I got married. They worked well, but coffee cans are harder to come by for me now, and I wondered what other methods might work. Joan and I contemplated 5 gallon buckets (too heavy? 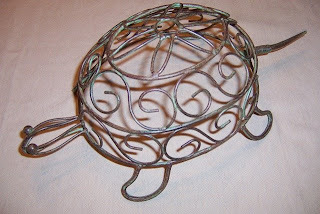 ), plastic pots with holes drilled (too expensive? ), and then suddenly we hit a brainstorm - the tyvek mailing envelope that Joan had sitting on the table between us - that she had earlier offered me knowing my love of recycling tyvek. Lightweight, non-fraying, easy to work with - a couple of boxed corners, a hanging strap made out of the excess cut off the top, a slit cut in the bottom to insert the plant -and we would be in business. Joan jumped right onto the project - making herself some bags and getting her tomatoes planted right away. Of course her planting season is a few weeks ahead of us - so I had a bit more time (in fact -we just had a frost warning last week!!!) 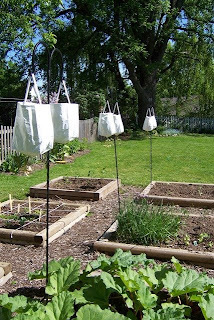 - but I got caught up and now have 6 planting bags hanging in my garden, with 2 more on the way to Sister Terri for her use. 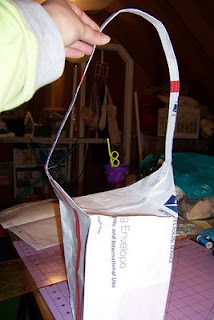 We used slightly different construction methods - Joan's pattern designer talents came out and she engineered a 2 envelope ultra reinforced bag. 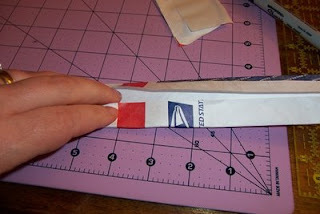 Mine - one envelope, a few seams, and away it goes. 4. The next step is to box the corners. 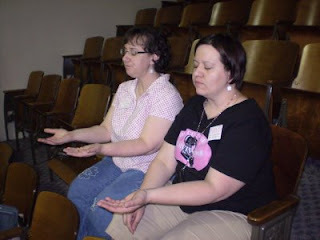 Open up the envelope and kind of "square it up" with your hands. 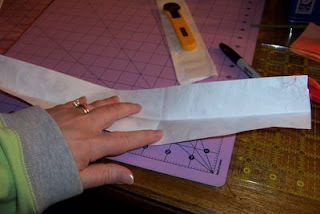 You will bring the side crease in to line up with the bottom crease -and using your ruler create a triangle about 6" wide. Draw a line with a permanent marker to give yourself a sewing line. Do this on both sides. 5. 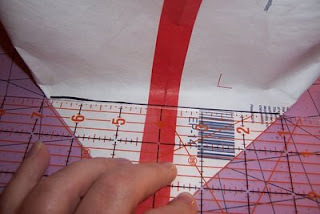 Sew along your drawn line -using long stitches. On my first bag I did two parallel rows of stitches to help prevent tear out/perforating, but I did not do this on the other 5 bags. 6. Once you have sewn both triangles and created a boxed bottom, you will have two triangular flaps on either side. DO NOT CUT THESE OFF! 7. You will attach your handle to the points of these triangles. This will help distribute the weight of the soil along the entire length of the handle and support the entire bag. I used double rows of zig zag stitching to attach my handles to the ends of the triangles, overlapping the two about 1/2 inch on either side. 8. After attaching the handles, turn the entire bag right side out. 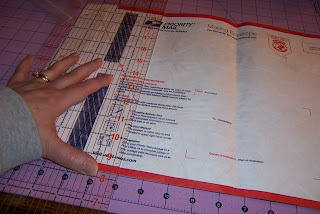 Fold over the top edge about 1/2". 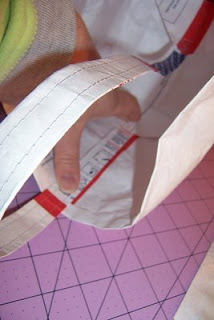 Align the handle along the inside side of the bag, pinning it carefully at the top edge on either side. The triangle flap should "stand" up along the side of the bag. Topstitch all the way around the top fold, reinforcing where the handle is with some extra rows of stitching, but being careful not to cause the handle to perforate. 9. 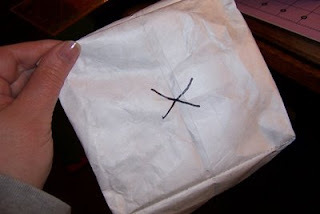 Draw an "X" on the bottom of the bag. This is where you will cut the bag open to accomodate your plants. I wrap my root ball in overlapping coffee filters, and then spread the filters out inside the bag once the root ball is inserted. 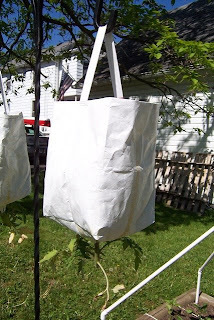 The soil holds the coffee filters in place and they add a bit of extra support around the opening in the bag. 10. Hang, water, and watch the plant turn up towards the sun. Nearly 16 years ago I made an impulse decision I was never to regret - I adopted two kittens and named them Joel and Maggie (ok - I was watching a lot of Northern Exposure back then). From the time I saw the ad in the paper and made my decision, drove about 15 miles to the store for supplies, and then to the address I had been given, and then home took less than 2 hours. I remembered the necessities like food and dishes and a litter box, but forgot to think about how I was going to get these guys home. They were kind enough to give me an empty Valvoline box, and I covered the top with my "how to raise a cat" magazine - driving home with one hand down country roads in the dark. It must have been that box ride home that gave both cats an affinity for boxes - Maggie for sleeping IN them - Joel for sleeping ON them. And from that first trip, Joel was a great traveler - weathering 6 moves in his nearly 16 years - 2 of them over 800 miles - as well as a number of visits to family when I was traveling just too long to leave them home alone (Maggie -not so great - but she was a trooper every time). In any of our moves to a new place, Joel was the first out of the cat carrier, first to explore every nook and cranny, and first to settle right in - Maggie usually took a few more days to come out from hiding. His sleek fur and habit of "slinking" soon earned him the nickname of "Panther Man" and "shhh - don't tell Joel he's really a cat and not a panther." 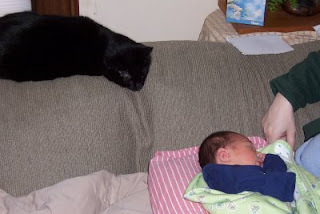 And when the Munchkin joined our family, JoJo was the first of the two to come anywhere near this noisy new member of the household, often watching over him from his perch on the back of the sofa, or sleeping near the crib. As the Munchkin grew, both cats became more wary, often scooting out of the room for self preservation. 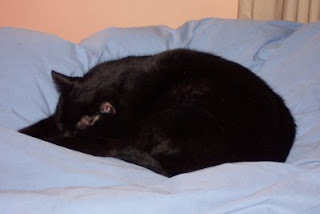 But come bedtime, JoJo and Maggie were back, snuggling near feet, begging for a spot under the covers, purring contentedly. Today we said goodbye to JoJo -and took him on his final journey. We were prepared with a proper box this time - hand made by Hubby - and laid him to rest under the forget-me-nots, in what the Munchkin is now calling "JoJo's Garden." Farewell, "Panther Man." You will be greatly missed. 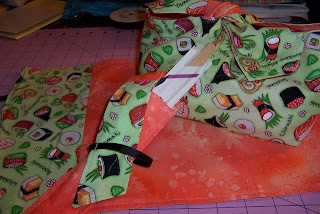 One of my purchases during my quilt retreat/shop hop jaunt to Ohio in April included a yummy lime green sushi fabric. In the midst of all the more traditional orientals, this fun and funky fabric just jumped out at me, and I immediately had a project in mind for it. See -Tuesday at RIT is known around my office as "Sushi Tuesday" - mainly because our favorite student employee takes full advantage of the weekly "foreign food specials" in one of our dining facilities and is sure to get her sushi on Tuesdays. When I saw this fabric, I immediately thought of her, and wanted to make something for her "Sushi Tuesday" lunches. 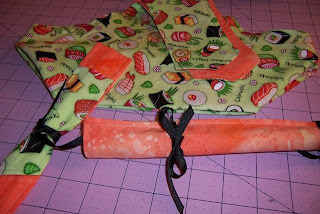 A friend of mine gave me this yummy peach fabric to coordinate with the sushi fabric -and so I made a Hobo Lunchbag, a chopstick holder and a rolled up placemat - and rounded out the set with a small square sushi fabric knapkin. The chopstick holder is a variation on a bag I received while I was in Japan that held a folding fan - the tie is attached to the top flap so no matter what size chopsticks you put into it (the wooden disposables tend to be smaller, while laquered chopsticks are usually longer) you can adjust the tie accordingly. I used black grosgrain ribbon, so that gave it a little texture, and picked up the black in the sushi print nicely. I used the same ties on the placemat, simply sewing them into the side seam before turning the placemat right sides out. After finishing up the Step it Up top and getting some lunch - I started on another project I had kitted up. It involved sewing a WHOLE lot of muslin squares to blue squares to make half square triangles, and as easy as that was, it was also VERY dull. 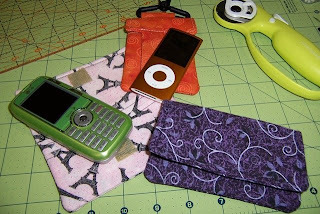 My sleep deprived brain needed a bit more excitement to keep it awake, so I decided to make myself a quick pouch for my new ORANGE iPod Nano (thanks Hubby - I love it!). I used a few construction tricks I have learned from making Lazy Girl Designs Wonder Wallets, and added a few touches of my own. 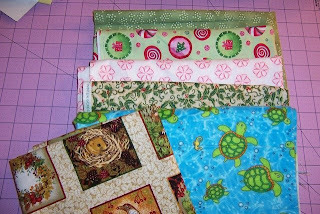 After that quick gratification project, I put together some block roll-ups under Jen's tutelage - Jen had provided me with one turtle fabric, and Jill with another - so I ended up making two. 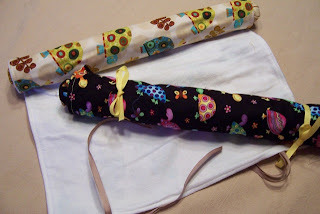 These are great - I hope to be doing more "quilting on the go" in the future and putting these to good use. And then I moved on to my next project - I had 5 blocks leftover from Corkscrewball and had planned to turn them into a table runner that we can use for our big family Fourth of July picnic at our house. I set them with the leftover fabric from the backing of that quilt, and even have some of that binding left as well. 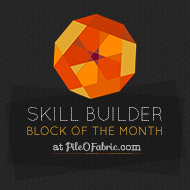 I plan to use this to practice some free motion quilting, too. This went together very quickly as most of the work was already done and I just had to rotary cut some strips for the borders and sashing. After this little flurry of progress, I kind of fizzled. I could not settle on a project to work on - and kind of wandered around talking to others and looking at what they were working on. After dinner we played a game of Left-Right-Center - and Becka cleaned up 2 of the 3 rounds. She was very generous with her winnings, though, and I got some fun and useful FQ's out of it all. It was fun to take a break from the gym and go down to the lounge and just chill for a bit. After the game - I kind of got a second wind energy wise, but was still not settling in on a project I wanted to work on. Becka and I stayed up until about 3:30ish - she was working on finishing up a pieced quilt back, and I was just kind of organizing my stuff - putting things away, and pulling out a few things that I planned to work on for Sunday. Luckily I did not wake up any of the sleeping beauties in my room as I came in and creeped into my upper bunk. After a contentious morning of backtalk, Hubby drove the Munchkin to daycare and had a little talk - culminating in an apology to Daddy and the promise of a later apology to Mommy. 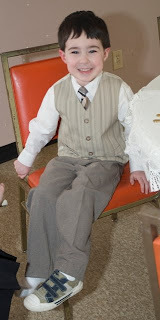 That kid cracks me up! It took me a second to realize he meant Summer Sunshine - which is now quilted to a backing of aquamarine blue with dragonflies and draped across the rocking chair in the living room. Actually - it is quilted AND bound - and done except for the label (need to take an updated photo - this one was from our Show and Tell when I got it back from Jill -the quilting is loop de loops and looks AWESOME!). Lazy Sister Sue? How is YOURS coming along??? PS - Munchkin did NOT get to sleep under it - because I never would have gotten it back. This one is MINE buddy - you have to wait on yours! On Friday morning, once we determined that Jill's water heater will handle 7 hot showers back to back, and we finished loading up cars (to the brim), we headed north through heavy traffic on unfamiliar roads - and the GPS was telling me to go in another direction. Luckily Sherry AKA AngryWhiteWoman was riding shotgun, manning the texts and cell phone calls, and keeping an eye out for our "pace cars" - otherwise I would have been a mess. We devoured lunch at Bob Evans - and I finally got what my body was wanting - coffee!!! Jill is not a coffee drinker, and I thought I could go the morning without it - but after the marathon drive on Thursday and the late night, I was needing the boost. When we got to the retreat center and got all unloaded and set up, the temperature had spiked into the mid 80's I think - and it was very humid. I was feeling the effects of the heat, the lack of sleep and sensory overload - so I chose to sit up in the bleachers overlooking the work space and trim the excess fabric and batting off the four quilts Jill had done for me. It was a bit cooler up there, less crowded, and I could just give myself a bit of time to acclimate without missing anything. 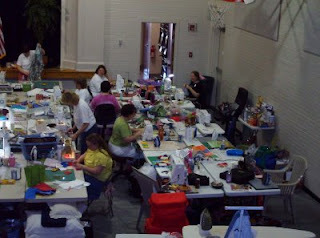 In hindsight it was good that I chose to do that task on Friday afternoon - as people started laying their finished projects across the chairs throughout the weekend, and by Sunday - or even Saturday afternoon - I would not have had enough room to spread out my quilts for trimming. 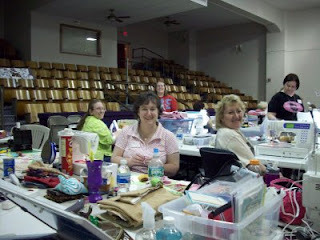 That little escape was just what the Dr. ordered, and in no time I was back down at my table, sewing away. One of these pictures is actually from Sunday, but you get the idea. It stayed pretty active and cluttered the entire time we were working. I had a number of projects kitted and ready to work on - and got right to work on a quilt top pattern I got from another blogger called Step it Up. 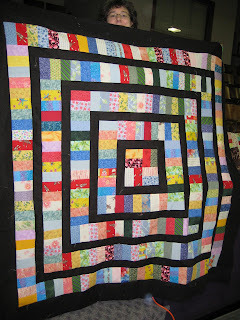 This is a scrappy quilt -although the original pattern calls for a Jelly Roll, and I had worked on busting scrap stash to put my kit together. My plan was to make this quilt, and then use the top to practice free motion quilting of borders and corner motifs - making a sampler of sorts. We took a break from working on Friday evening to have a NY vs Wisconsin cheese curd test between Jen and I. 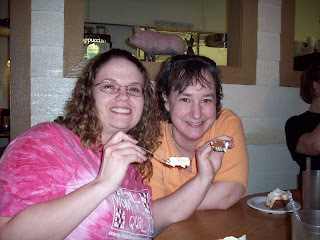 We both easily identified the curds from our home states - both were good but then I like cheese in just about any form - and then we shared them with the "curd virgins" and everyone else, too. Oh - along with working on the quilt top, I put together a number of my little PickAPockets - I had done an iron on transfer of our retreat logo onto white fabric, and then backed it with bright pinks and tucked in some chocolates that Lazy Sister Sue had sent along for us all to share. I did not manage to get these done pre-Retreat and have them on everyone's tables like many of our other Peeps did (everyone was so creative and so generous!!!) - but I passed them out as soon as I could get them done. The leftover transfers got taken by Jen for making some water bottle cozies, although I don't think any of those got done at Retreat. (sure -they arrived right when I decided to take a quick run to the bathroom! 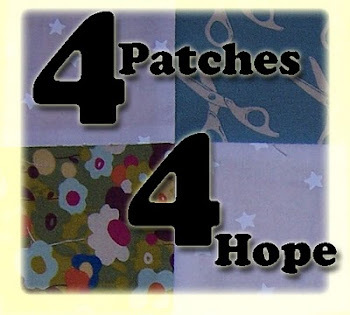 The second half from Fabric Shack- these inclue a layer cake, some fat quarters, and some yardage. In case you are wondering about the orange and brown floral - those are the school colors where I work, and I tend to make people at work things out of those colors. The mechanics fabric is just enough for a fancy fun cuff on a pillowcase for my FIL for Father's Day. Now just need to find handyman tool fabric for MY dad and I will be all set. The older they get, the tougher and tougher it is to get gifts for them!!! Sleep came easily this week - and usually early - but it's taken a while for me to mentally process through everything that happened last weekend and then turn it into something coherent that people might want to read. I don't know how successful I will be at that - but here goes. I forgot a few things from Day 1 - driving through Columbus, OH in heavy traffic and construction with the GPS in my lap (the suction cup kept coming off the windshield) after 14 years of being away - the gorgeous spring colors of everything in bloom as I headed North to South (although I had to retreat to earlier spring on the way home) - Jill texting me as I arrived at Fabric Shack about 45 minutes before they were going to be there to be sure I was going to be ok waiting (waiting in a fabric shop - gee - what a hardship) - and the glorious glorious peanut butter pie. (ok - so I mentioned that in the first post, too... but it was REALLY good). Shopping with the gang was wonderful - it was fun to see what kinds of fabrics caught other people's attention, or what they were on a quest for. I already had most of my selections stacked and cut - although looking at things through their eyes helped me find a few other treasures. I don't have pictures of all my purchases - one I can't show yet as it is for a special project and I don't want the recipient to see it - but will try to show some of them soon. Luckily for me, Jill decided to ride shotgun with me for the rest of the evening. After 8+ hours of driving I was beginning to lose all sense of direction - plus it was nice having someone to talk to in the car after 8 hours of just me. After a buzz through Best Friends - we hit WalMart for some sword fighting (foam), snack snagging (mmm - Strawberry Cream Oreos and Licorice Snaps), dinner buying (pizza) fun. We all then piled into Jill's house for the evening -and I finally got to meet Max and Maisy - Jill's dogs. Pizza's popped into the oven, and we all settled in to a variety of projects to get ready for the retreat. 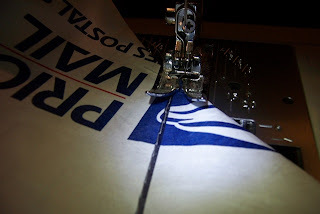 I wasn't much good for anything other than sign making and taking dictation - so I left the sewing machine and hand needle and scissor operations to others. We finally faded around 1:30 AM - Jennifer says I was finishing my sentences very......very.....very.... slowly - but by that time I had been up for nearly 21 hours. The dogs snuggled in with me -right up until the moment Jill's feet hit the stairs to head up, and then they were gone.